Down here in Texas, we rarely come face to face with the evils of winter. The snow tends to stay up north and the ice doesn’t dare mess with Austin, Texas… until, of course, it does. Us Austin citizens exist in this sunny haven for a reason, but sometimes that reason is infiltrated by nature. While those northerners might know how to deal with the frost, we’re a little bit more dumbfounded. Not only do we have issues navigating through a quarter of an inch of snow, but we’re also at a complete loss about what to do in the event that our pipes freeze. 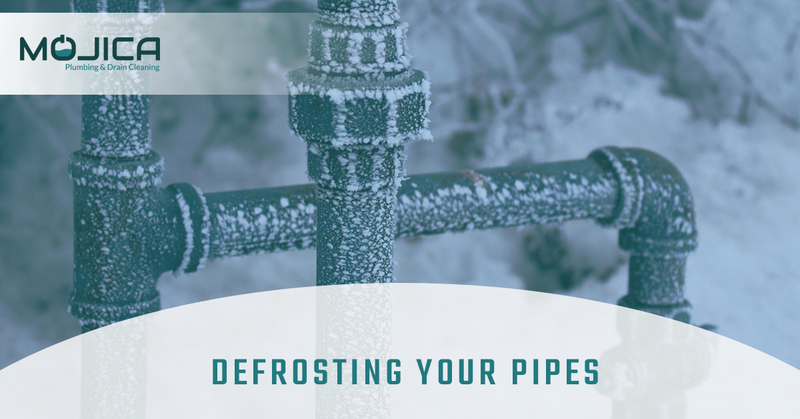 Today, we’re going to talk a bit about what to do when your pipes freeze after a chilly night. While this is something of a rare event in Texas, weather does tend to be unpredictable. Frozen pipes can wreak havoc on your plumbing if they’re not thawed properly. Mojica Plumbing & Drain Cleaning has come up with a few options for thawing your pipes and preventing them from bursting. Frozen pipes don’t sound all that threatening. What’s a little bit of ice going to do to your plumbing? Well, when most things are frozen or heated, the particles that compose the material either expand or contract. On a frigid night, the cold causes the metal in your pipes to contract, or essentially shrink. Additionally, since we’re not too accustomed to the harsh winters, many home plumbing systems aren’t as insulated as those in the north, making us especially vulnerable. When turning on the hot water too quickly, the change in temperatures can break your pipes, which is not a cheap and easy thing to fix. The best thing to do in this situation is to first locate the frozen pipes. Check the pipes in your home that are the most likely to freeze and are the least insulated, such as those found in basements and attics. If you find frozen pipes, start taking the steps to thaw them, which we’ll mention below. However, in the event that your pipes are broken or cracked, consider calling your local plumber as quickly as possible to have them replaced or mended! The best advice we can give you here is to start slow. By any means, do not quickly run the hot water! We suggest starting with a good ol’ hair dryer, if possible. Slowly run the hair dryer over the spots that have frozen over, so as to gradually melt any ice and restore the pipes back to their optimum functioning. Again, slow is key. It’s not easy to reach most pipes with a hair dryer. Another option for restoring your pipes to their former, Texan glory is to simply lay a warm cloth over them. Soak a towel or dishrag in some hot water and wrap it around the pipes. After several minutes, take the towels off and repeat procedure until the pipes begin to thaw. The biggest mistake you can make in this situation is leaving the wet towel on the pipes, allowing the towel to freeze along with it and inhibiting the pipes from defrosting. Running water is less likely to freeze than stagnant water, and running your faucets so that they slowly drip can both thaw out frozen pipes and prevent future issues caused by freezing. Again, slow and steady wins the race here and turning your faucet on full throttle can lead to some burst pipes that are rather expensive to fix. Allow your faucets to slowly drip into the sink basin for for a few hours or until the temperatures begin to warm up. This might seem like a no brainer, but a heated house is a great ally in the fight against frosty pipes. Turning up the heat might put a little bit of weight on the gas bill, but a day or two of a toasty home might be more worth it than having to mend or replace pipes that cracked open in the face of winter. You’d be surprised what a few degrees warmer in temperature can do for helping with frosty pipes. Thanks for reading today’s blog post and we sure do hope that the temps aren’t going to dip down below 30 degrees anytime soon. In the case that you ignored this advice, or perhaps came across it too late and you switched on the hot water a little too quickly, causing a pipe or two burst open, your local plumbers here at Mojica Plumbing & Drain Cleaning will be happy to give you a hand with minimal judgement. Call today!